In the past few weeks, Linda and I have had the joy of taking part in several gatherings for friends of Heritage. We’ve been in Barrie and London for lunchtime receptions and hosted several gatherings in our home. It’s been encouraging to hear from Heritage alumni how their time at the school shaped their knowledge of God and His Word. 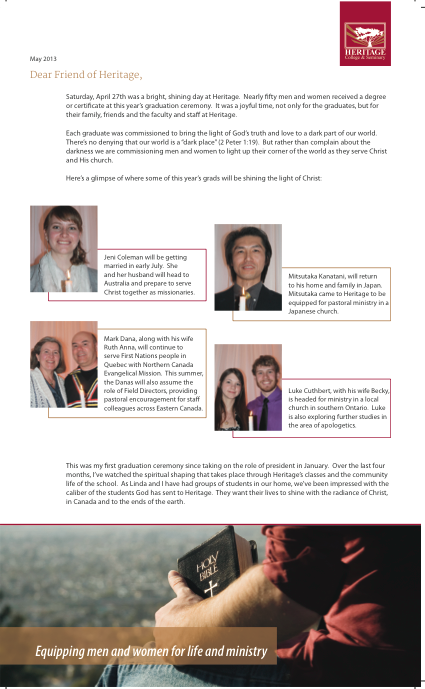 And how Heritage helped prepare them for a life of ministry. I’m convinced that Heritage has an important part to play in the overall health and expansion of the Church, both locally in Canada and globally to the ends of the earth (Acts 1:8). Recently, I wrote a letter that we sent out to Friends of Heritage. It gives an update on some of the evidences of God’s grace we’ve recently experienced as well as the challenges we find ourselves facing. As you read the letter (click here), please ask God to continue to use Heritage to train stellar men and women to be a light for Christ in a dark world.